Do you keep lists? I do! I'm a bit of a "doer"...it makes me feel all warm and cozy to see a nice list, checkmarked off as things are completed! You know what's great about what's on these AIP lists? FOOD. And more than food, it's a pathway to healing. So I especially like these lists, because the end goal is so much bigger than just a completed task list! Before I go any further, I want to get something out of the way. It's easy to live and die by a list. I do not, not, not want anyone to feel like they are defined by a list. The overall, big-picture purpose of these lists is to help you/me/us determine what works best for us in an organized and strategic way...yes, part of the process is "avoiding" things, but that is meant to be TEMPORARY. It is never meant to define you. So let's talk about these lists for just a second. First, I hate saying "Avoid". It just sounds like a downer! But there really isn't anything else to call it, so "Avoid" it is. Now, having said that, let's talk about my preferred way of looking at the avoid stuff. Now let's talk about that "Include" list! Notice it's longer than the "Avoid" list! That is a great thing, my friend. 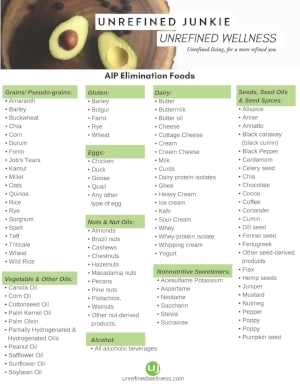 I didn't realize how MUCH food is out there (real food, anyway) until I did AIP. I mean, I never would have thought of eating bison or dates or coconut butter before. But now, these things are staples in my house. I hope these are helpful! It's my goal to start adding more resources for you!